Empxtrack is a highly configurable cloud based software that simplifies leave management process, from completing leave application by employees to approval by HR. Easy-to-use interface facilitates all stakeholders to easily access leave data and transactions. Save time, money and effort by monitoring and tracking leaves in a systematic manner. 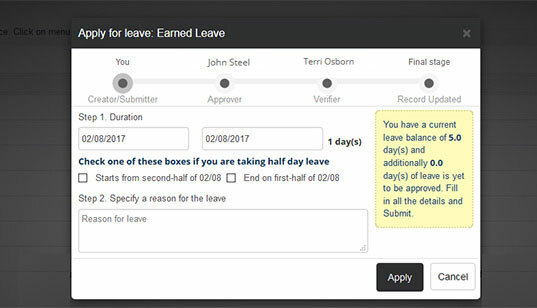 Empxtrack leave management module allows employees to submit leave applications online and makes it easier for managers & HR to manage leave requests and approvals even on the move. Flexibility to manage paid time off, leave entitlements, identify leave history and existing leave balances on mobile devices reduces leave related queries for HR. 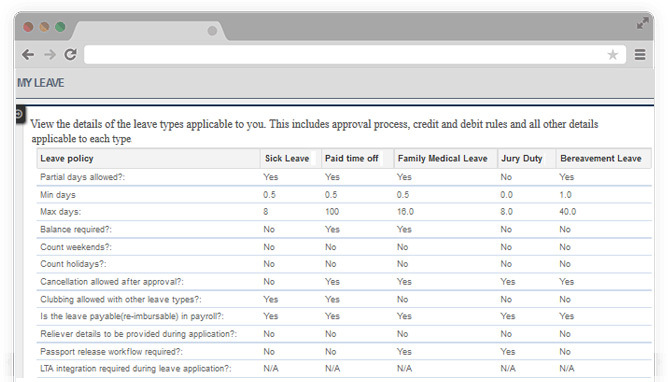 View reports and dashboards to analyse employee leave data and identify leave patterns. Full visibility on employee leave data and staff availability enables managers and HR to continuously track employee absences and lessen the impact of absenteeism. Easy-to-use Empxtrack leave management module gives access to company’s leave policy. It does not allow employees or managers to bypass rules while applying for or approving leaves, thus ensuring compliance. Simplify year-end leave processing to avoid confusion in leave lapsing, carry-forward, encashment and more. Customize Leave Types, Leave Credit Rules, and set up complex Leave Policies as per your company needs. Easily prepare and publish Location-specific Holiday Calendars for employees working in different locations. In-built system conveys Leave Policy Rules. Employees can, at any time, refer to the Leave Policy before applying for Leave. Manage leave transactions accurately and automatically import Leave Data in payroll for accurate Salary Calculations. Empxtrack Leave Management offers a full API for integration with other software. API provides easy export of the leave records. User friendly software with online Help, Self-Training tutorials, and easy to use interface. Our Support Teams are available 24 X 7.